Is Dental Porcelain Strong Enough to Repair My Smile? Many patients can’t understand why the dentist would recommend porcelain materials to repair teeth. 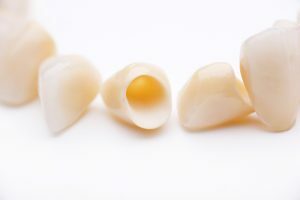 Delicate things like porcelain dolls and porcelain teacups come to mind first, and it may seem unlikely that porcelain is strong enough to repair damaged teeth or enhance your smile. However, think about the strength of a porcelain knife. The type of porcelain, design, and use make all the difference when it comes to the strength of porcelain. In fact, dental-grade porcelain is typically just as strong (if not stronger) than your natural tooth enamel. Whether you’re considering cosmetic treatment using porcelain veneers or dental restoration with a porcelain crown or bridge, a skilled dentist can create durable, long lasting porcelain restorations that leave you with flawless smiles. The strength of a porcelain restoration is in the design and placement. The supportive dentin and pulp layers of your tooth provide a sturdy foundation for porcelain. When molded to fit snugly against your remaining healthy tooth structures and cemented in place, porcelain is just as strong as tooth enamel. At Longmont Complete Dentistry, our dedicated dentists and dental care team are happy to offer patients a wide range of cosmetic and restorative dentistry services, using the highest quality porcelain and ceramic materials. If you want to learn more about your restoration options, call to schedule a treatment consultation visit with our caring Longmont dental team today. We’ll be happy to examine your smile and walk you through all the available treatment options and materials. Whether you need a dental restoration or cosmetic dentistry, our skilled dentists offer a wide range of services to meet almost any patient’s need. Comments Off on Is Dental Porcelain Strong Enough to Repair My Smile?